Well kept camping sites. Easy drive up style. Picnic tables and fire pits on site. Bathrooms and dumpster close by. River that is walk and drive through! As the saying goes, you can’t put your foot in the same river twice. It’s always changing. I discovered that this is so true about Lowden State Park. My first trip here was on my own… well, my dog joined me. We spent some quiet time hiking and relaxing earlier in the year. This time is different. This time camping was a communal event that left me feeling like I was at a different place. Campground review: Driving in to Lowden State Park is pretty straightforward. You go to Oregon, Illinois, and then head north a couple miles. The entrance involves driving past half of the campground and discovering that the camp host is waiting to sign you in. She found our reservation and directed us to a spot right around the corner. A crowd of waves greeted us as we pulled our teardrop camper past a small gathering of folk. These were fellow teardrop campers, Tearjerkers - the Land of Lincoln subgroup. We are spending the weekend here to share some time and stories with each other. Little People (or Little Campers) Unite! The camp host already had my name clothes pinned to the post our site. We were nestled between a beautiful homemade teardrop camper and a super large camper that dwarfed both of ours together. This site is conveniently placed near the shower house (I didn’t even visit the showers or flushing toilets on our last trip). Water and garbage are just a few steps away. Our solar was enough but there is an electric hook up right at the end of the pull-in. A few minutes of setting up and I walked over to join in the Tearjerker dinner of finger food - I must admit that the jalapeño hummus I brought was very good. There was more than enough room at our president’s campsite for our growing group. 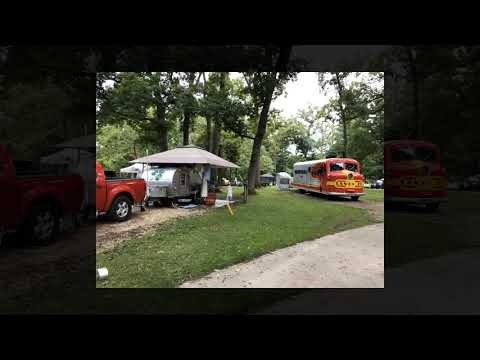 After everyone arrived, we filled up over 20 campsites (look at the pictures to see a variety of campers and vehicles). A roaring campfire lit up the night with stories, laughter and connection. Lowden State Park asks you to notify them of larger groups. Our group had campsites all centered around this site. This location became our evening, breakfast and dinner site for the weekend. 40+ people gathered together for a breakfast of scrambled eggs and donuts. Our dinner was a potluck of vegetarian side dishes and barbecued chicken or roast beef. I was impressed by the way the resources and space at Lowden accommodated our large group. The Tearjerkers are a group of people who all own teardrop campers. They range from store bought to homemade (kits or your own design). The group is friendly. I loved the way everybody walked around to see each other's teardrops. We shared ideas for the next add-on and talked about how we built different features. Each state has their own sub-group which organizes events. You can stay within your own state or stop at a gathering as you pass through other areas. My dog and I went out hiking early in the morning. To our joy, we found Black Hawk’s statue was uncovered. They are renovating it to preserve it for the future. We could still see cracks and chips but the uncovered Black Hawk cut a regal image looking out over the Rock River. Even with the recent rain, the damp trails were well taken care of and gave my dog an outlet for her energy. A group of families filled in an area on the other side of the campground. The children raced each other around their loop and then sped over to the playground. Lowden is large enough to accommodate a few groups of people along with all the individual campers. I was left with such a pleasant experience of Lowden. Camping with a friendly group certainly made this campground a more enriching experience. 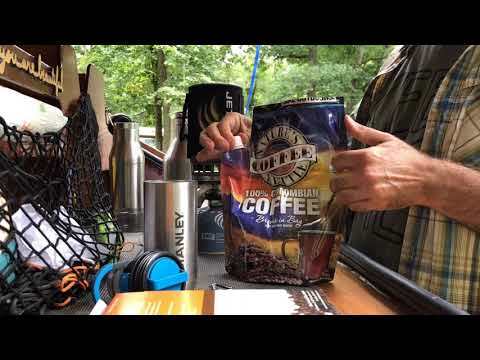 Nature’s Kettle Coffee (product review): As a Dyrt Ranger, I sometimes am gifted products to try out and review. This trip I came supplied with some coffee. Normally I use a pour over system where the grounds sit in a cone on top of my cup and I slowly pour the hot water in. With an unstable cone atop my cup, I will admit to having knocked over the coffee in the process of pouring the water in. I was excited to see what the Kettle System would be like. Nature’s Kettle comes in a reusable kettle to contain the water, grounds and coffee. While 2 cups of water was heating on my Jetboil, I looked the system over. It is a very straightforward set up. The top opens up like a ziplock bag. Coffee grounds are pre-measured in an individual cloth bag. I loved this feature! The side of me that strives for easy cleanup solutions was happy that I didn’t have to worry about loose grounds. The bag of grounds goes in the top of the kettle. Super simple. The water was ready so I slowly poured it in. The coffee steeped for a minute while I heated up the other 2 cups of water. When all 4 cups were poured in the bottom part of the kettle was full. I poured it all into a 32 ounce cup and then poured it over the grounds and into the kettle a second time. This gave me a cup of coffee that was full of flavor and depth - not quite up to french press coffee but so much better than instant. Check out the video to see me making the coffee. It really is a simple and clever process. I was able to make about 32 ounces of coffee in the double pour through method. This gave me plenty of coffee for breakfast and to have on reserve through the rest of the day. I poured it out of the kettle to put in an insulated cup. This kept the coffee warm and let me clean out the kettle. Cleaning up was a breeze thanks to the contained grounds. Just rinse out the kettle and it’s ready to go for tomorrow. Nature’s Kettle Coffee hit on a good system. Pouring the coffee through a second time produces a cup of coffee that makes your morning perk right up. With the rain and the proliferation of mosquitoes, we were wandering around southern Wisconsin without a plan when we stumbled across this county park. 50 sites, many with electric and very reasonably priced ($25 for electric/$18 non which includes a $2 senior discount). Spaces are generous in size although no privacy between them. Bathrooms are very large and clean. Showers but didn’t use so can’t comment on their condition. Dishwashing sink! Adjacent to the Lake Farm SRA and several multi-use trails. Note that it is in the flight path of the airport so you will hear planes. The campground was very pretty, clean, and friendly staff. The bath houses were clean, the outhouses were not bad. Nice walking paths. Grills on the fire pits. I recommend not camping on the downside of the tent Hills. If there is rain you will be washed out. visited in fall 2017. not very busy. clean pit toilets. aid the street is the lowden state park main camping area so close to showers and a little camp store and hot dog vendor. Small campground, but you play disc golf and lovely trails! So close to get away from the city. Cleanest IL State Park I had been to. nice camp sites not too close together. Loved driving through the fjords. On-site restaurant was nice, cabins were clean and cozy. So much to do and not crazy prices. Creek tubing/kayaking is so much fun. Lots of activities and fun. This is a very nice and clean campground with themed weekends and even a lake…the only reason I gave this campground 4 stars and not 5 is because they put the weekend campers near the train tracks the run right by the campground and the train goes barreling through there blasting it’s horn at all hours of the night! This is the second KOA I’ve stayed at and is by far the better one of the two, the staff was super friendly and there was a lot of activities for the kids to do. My family and I will definitely be back here! Although it is a beautiful location, our site, 124 it was situated next to the lake. And across the lake was Timberlake playhouse where they had live music several times throughout the day. To the other side of us was the live music at the resort, which was impressive considering. If you like that kind of thing. It was way too loud for me to enjoy this particular campground. Most of the sites had concrete pads and overall it was well-maintained. To me there is just nothing wilderness like about this place. The fishing was less than par. My son enjoyed the pool and some of the activities, it was Lego weekend. What I really appreciated was the opportunity to use a couple items we received from Matador. The one thing I really enjoyed using was the Matador transit tote bag. That little thing was easy to pack in my bag and when I needed to use it I packed a Ton of stuff in it. It was incredibly durable and able to hold all of the stuff I needed for my puppy one day. And then I would give it a thumbs up for being puppy proof as well. She could not tear through that thing if she wanted to. I’m excited to use other Matador gear, but I can tell you that this tote will go with me everywhere, on every trip camping or not. It’s lightweight, durable, and a great looking tote. Overall it packs a lot of stuff into it. I can attest that 4 beach towels, suntan lotion, and a frisbee all fit comfortably in there. Great place to camp with lits of things to do: boating, biking, nature board walks, dear, goose and bird watching and a nature center. The Maple Fest blue grass festival is the best. A group campground for tents and another one for campers. I bike camp there every year. Lots of great music all day and good musicians singing by the camp fire all night. Reservations may be necessary for summer weekends. As of this year some of the tent sites wont allow pit fires. Best to check and see if the site allows a pit fire before setting up your tent. Wood is avaliable so you wont have to bring your own. Excellent campground on lake Mendota. Great for family camping . Lots of places to eat near by if you dont want to cook and still want to be outside. 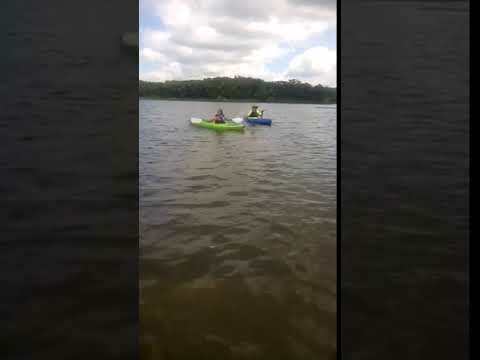 I like kayaking from Olbrich park and spending a night or two. If the weather takes a turn for the worse or your kids get sick you can go home. It's a pretty state park with clean, nice bathrooms & showers on the electric loop. Tent loop only has pit toilets. We stayed on the tent loop, where the sites were very large and mostly shaded. 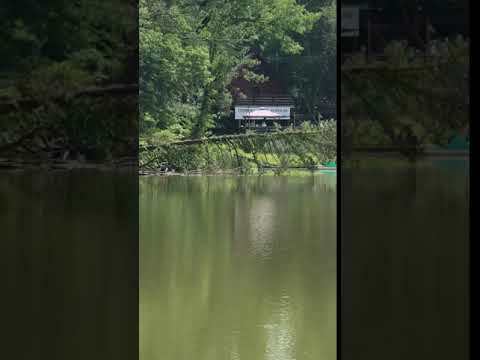 The lake has had algae issues for quite some time, so there was no swimming or boating. There is a kid's fishing pond, but we didn't see anyone catch a thing, so not sure if it's actually stocked or not. The road through the park is hilly and in poor condition. I've heard great things about this park, but it feels as if it's fallen victim to the state's financial problems.